Code green, a state of Peace. We ended our night last night with a dinner at a new Izakaya that wasn’t open the night before. It seems like Ansen was punishing us for all the grief we’ve been giving him about his Japanese because he said he’d catch up and didn’t actually come to the restaurant. When we got there it proved to be much harder getting along without him. In the end I had to run outside and take a picture of the sign on the front of the restaurant and show the poor waitress. 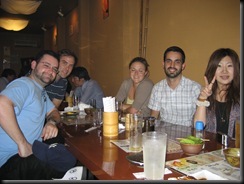 Its a good thing that I’ve mastered the Japanese I need to get along at an Izakaya. Whiskey = "wis-u-key" and beer = "bi-ru" other than that I have to ask Ansen to help out because ordering pork or "Bu-ta ni-ku" may result in some strange part of the pig you are not used to so I rely pretty heavily on the more Japanese proficient members of the group for the specifics. In the end we did manage to have a great meal, so great in fact that we skipped Gion, and we are planning on heading there as soon as possible. 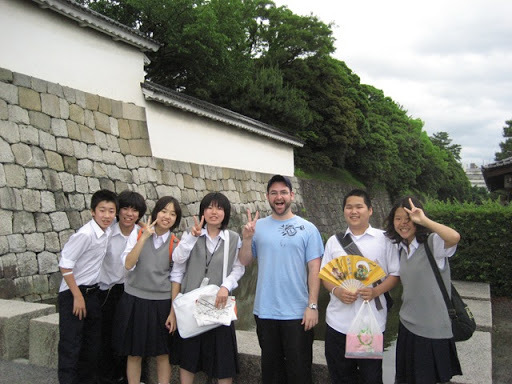 We started off the morning In a rush, they closed the Shogunate palace pretty close to us leaving yesterday so we wanted to get going right away today. Because of this breakfast suffered. 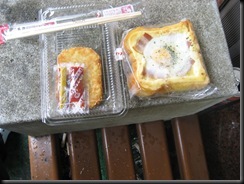 I did manage to find a strange little combo for breakfast on the run. That’s a piece of toast with bacon and an egg, and a hash brown. Pretty good for short notice. Our first stop today was pretty amazing, also a nice change up since we’ve been visiting mostly Shinto shrines, but today was all for Buddha. 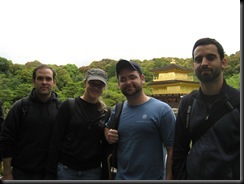 Here is us all in front of Fushimi Inari Taisha shrine, which we referred to as "the gorden pagoda"
And here is a shot of the pristine background that we are ruining in the picture above. 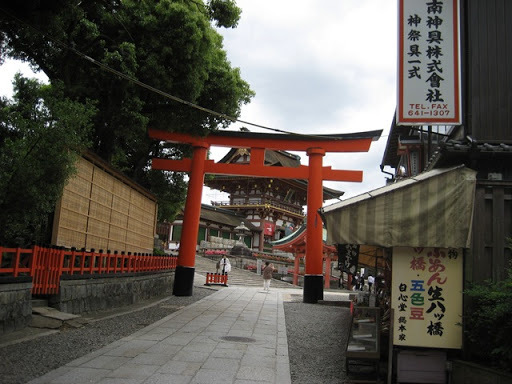 In another amazing strike of luck a group of Japanese University students accosted us at the entrance and asked if it would be ok with us if they guided through the shrine, of course we thought it was a great Idea. 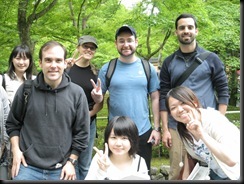 Here is a quick shot of all of use after the tour (they were great guides). 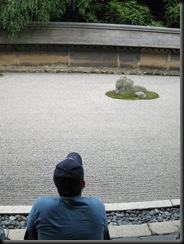 After that we went to Ryoan-ji a Zen Buddhist temple, In the opinion of some THE Zen Buddhist temple, and I’l show you in a minute why. 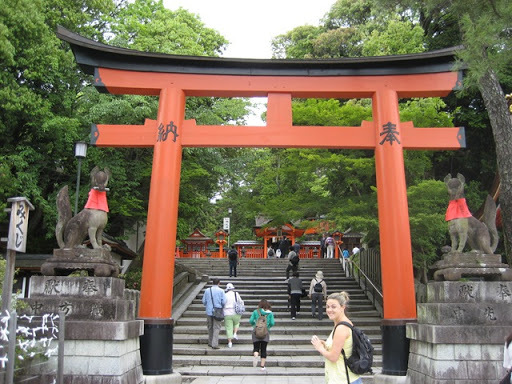 The entire entrance to the temple was a testament to Japanese landscaping and their ability to give you peace in the middle of a city filled with noise and chaos. 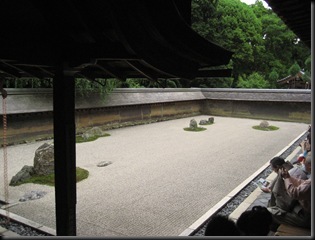 This temple is home to the original Zen rock garden, only 15 rocks and white gravel in a rectangle 25×10 meters. Looking into the garden for just a few minutes was enough to make me forget about everything going on around me, even the voices of the throngs of people around me disappeared, it was a truly grounding experience. And here is a shot of the whole thing. 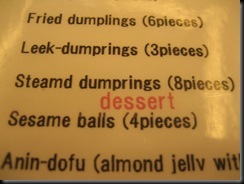 Oh yea I just thought you might want to see this… It caused a great deal of laughter when we spotted it. 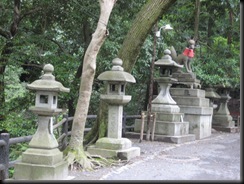 I really felt like I just glanced over the first shrine we went to today and I really think it deserves more. If you’re going to read this looking for some funny pictures or anecdotes you might as well just stop reading here, this was more of a peaceful experience. 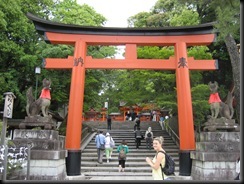 As we moved closer and closer to the temple the gates got more elaborate and closer together. 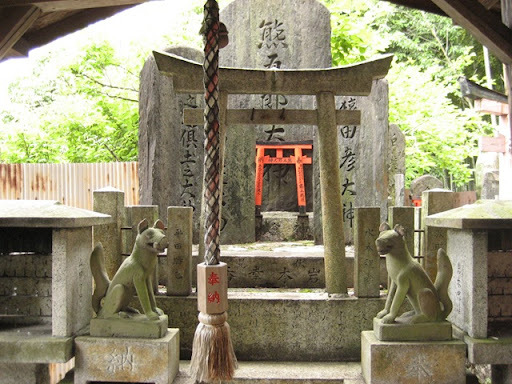 The main entrance had two statues of Kitsune on either side, one holding a scroll and one holding something i couldn’t quite make out. 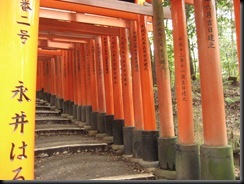 The temple is called Fushimi Inari. As we moved through the temple there were a series of statues and the story of this God was told to me in bits and pieces. Apparently when the crops did well in rural japan small rodents and such posed a great threat to the well being of the nations produce. The fox usually arrived and took care of the small rodent problem so it was seen as a blessing. This feeling of thanks eventually developed into worship. 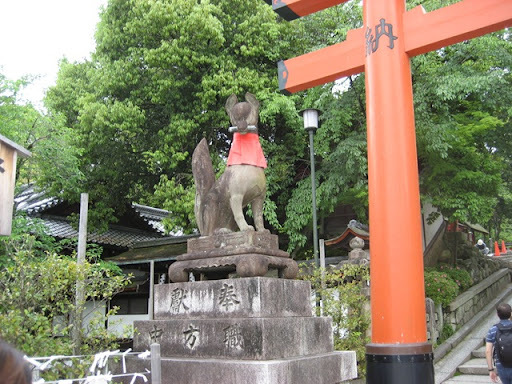 The interesting part to me is that the fox has developed into a deity with two sides, One side brings prosperity and wealth and because of this it is prayed to by people wishing for personal endeavors to go well. 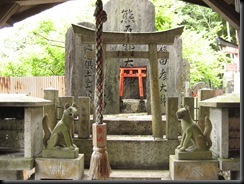 The other side is one of mischief, the fox God can turn into people and trick you. According to some of the locals Kitsune can do anything from forcing you into bad money decisions to seducing you into a failed marriage. 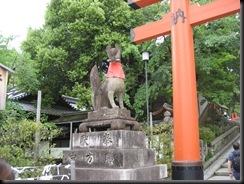 In this picture Kitsune is depicted holding a key (that bent thing in his mouth) which is meant to represent the key to the grainery that he watched over. It was a truly amazing sight. 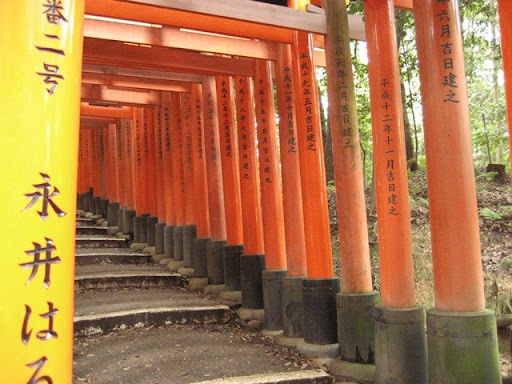 As we moved through the maze of gates and fox idols we saw a small mountain path and figured it would be as good a path as any to follow. After much climbing, it soon led us to a series of narrow 1×1 foot brick paths along cliff edges in the most beautiful (well only really) bamboo forest I had ever seen. 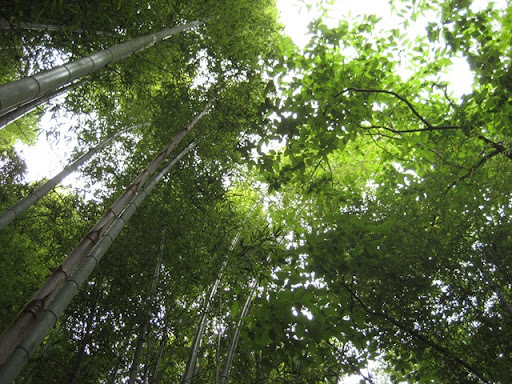 Once the forest broke, we ended up out in the street, right in the depths of rural Kyoto. We were spent, time to find some lunch and get a second wind. The whole experience left me feeling fulfilled as I’ve always felt a connection to Kitsune ever since hearing about it several years ago. 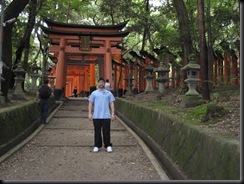 Well I just felt that I should say a few more words about this particular shrine since it was just a great experience to be there. I’l be getting back to the usual entertaining posts forth with. 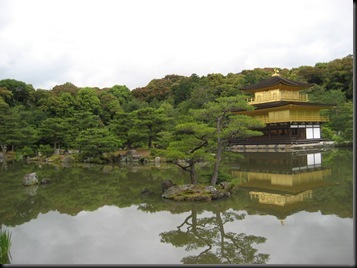 Sorry internet is not as easy to come by in kyoto so my posts won’t be as frequent. Although i did find a way to write my posts offline and sync them when I get the chance, so after this one they shouldn’t be made any shorter by the lack of connection. I apologize that I have to cut this post short since we are out on a nightly adventure to "Gion" but we did manage to get to the shogunate palace today which was amazing. Keara and Ansen were mad that I kept everybody up with my snoring last night so here is a shot of her taking out her rage, you may also notice the 400 year old palace in the background. On the way out we had the good fortune of being interviewed by a class of middle school children it was hilarious and they were great. I had to cut out early this morning and wasn’t able to give you the full scoop on yesterday. I apologize… I’l try to not let it happen again. So while we were in Harajuku we did finally get to a sushi bar, it was the traditional deal with a conveyor belt of plates going around to all the patrons. We were charged based on the color of the plates we had taken off the conveyor. Here is a shot of the view from where I was sitting: Green tea powder was included and the spout at the bottom of the picture let out piping hot water. The fish was delicious, and I did venture into some of the odd things that came about, but in the end I mostly had tuna, salmon and shrimp… After the sushi we went back to Shinjuku to a place Laz had been talking up. It was touted as a “Horror dining experience” we couldn’t resist. When we got to the place the sign outside said “the Lock Up” and was all black and red with blood all over it… looked interesting. We had to go down a flight of stairs to even see the county fair looking horror house entrance of the restaurant. As we went deeper into its bowels it got darker and then out of nowhere… flashing lights and a chained up man trying to get out of a chair behind some bars just inches from us!! A cheap parlor trick, but it worked. We were then greeted by a girl in a leather police outfit who chained up one of our party and led us to a cell deep within.Inside the cell was a table where we sat and the cell door (which was extra squeeky) was slammed shut behind us: The menu was shrouded in darkness as the gimmicky drinks had names like “shock” (which I ordered) and gave no hint as to what they may contain. When they arrived they looked more like middle school science experiments than drinks and most of them didn’t taste very good, mine tasted like grain alcohol with concentrated lemon juice: The place had already filled its radicality quota and we were just getting ready to ask for the bill when all of a sudden… All the lights turned off and sirens and black lights started going off with the occasional strobe of light, in the distance you could here women screaming and cell doors opening and closing. Then, from above me a long haired body in a jump suit came down reaching for Keara and I! We tried our best to avoid him but he kept reaching, he disappeared for a minute then opened our cell gate and ran in and started CHOKING poor keara!!! (it was a more playful choking, but even so this sort of thing would certainly incur a law suit back in the states) She was crying with laughter (and fear) and we just waited in the dark while the screaming and sounds continued. One more man in a ski mask came into our cell but he just sat, crossed his legs and twiddled his fingers quite innocently… the oddity of it made the action a little creepy in itself. Afterward, we gathered ourselves and paid the bill, made our way home and slept heartily. The point of the next day (today) was supposed to be Mt. Fuji. We did make our way to the base of the mountain but the weather did not cooperate: If you can make it out, that is the snow cap of Mt. Fuji behind that light pole, needless to say we couldn’t get too far up the mountain due to the weather. But it wasn’t a complete bust, i did get to try a new type of meat. While we were waiting for the return bus I had some horse meat udon, I would have snapped a shot of the full bowl but I was so hungry that I completely forgot so here is a shot of the mostly empty bowl: The meat was pretty much ground which I thought would make it difficult to eat with chopsticks, but it held together well and was incredibly tasty. If you cant see the last one (I apologize for the darkness I couldn’t get the flash on before she crossed the street) it is a girl with a shirt that says “worlds best grandpa.” which I thought was amazing. Well that’s pretty much everything for right now. Talk to you all soon. 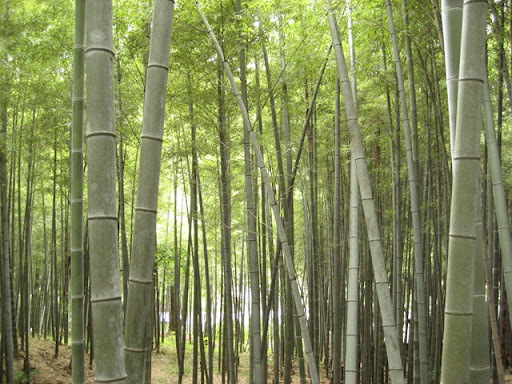 yesterday brought a new set of cultural realities of Japan to light. We started out checking off the list one of the things I absolutely needed to do here: eating at a ramen shop, and it was… AMAZING!! never has a bowl of soup provided such nourishment! That’s pork stock ramen and it was amazing, here slurping is a sign that the food is good so you can feel free to slurp away, it took a bit of getting used to but in the end i finished both my bowl and Ansens… I know i’m a pig but it was delicious. 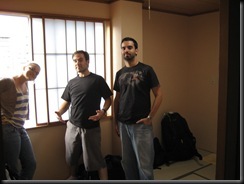 Stomachs full, we start off for the more stoic section of our day and head off to the temples of Tokyo. 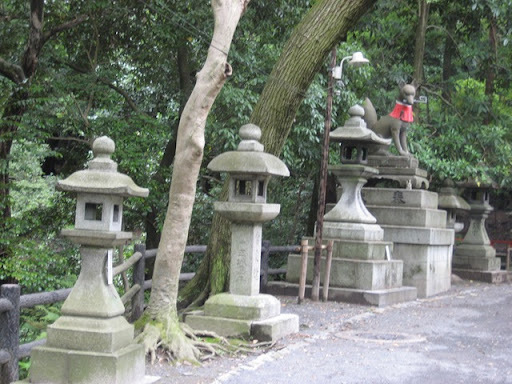 We started at the Hozo-Mon, where i became familiar with the steps of entering a shrine, first you cleanse your hands and mouth with holy water: Then you light incense and bathe in the smoke from them, then make a small donation, make a wish and enter the temple. We also pulled our fortunes, as luck would have it I got exactly the fortune i wanted. to not draw it out it basically said “if I keep making the correct choices life will continue to be bountiful” I liked this because it already assumed life was good, and so far i have no complaints. 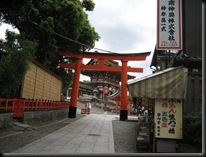 This was a buddhist temple and the two others we visited in the day were shinto, but they have similar entrance procedures minus the smoke bathing. After the small shinto shrine right next to Hozo-Mon we moved to Harajuku which i know is famous for the crazily dressed teenagers (which are actually much more crazily dressed than people think) but its also home to the Meiji shrine: That is actually just the outer gate if you can believe it, but the inside is so vast that its hard to get a good picture. The craziest thing about this place is that this is one of the most populous cities on earth and in this place there is complete silence and peace… It was amazing. The next thing that I really can’t leave out about this part of the city is the way out there way that these kids dress, I had to take most of these pictures in passing, from the hip and with the flash off so some of them are a bit blurry. I just kept thinking how my parents used to say things to me about the way I was dressed when i left the house sometimes and what a conservative Japanese mother must scream at these kids on a daily basis. Im not entirely sure whats up with the nose bands but I think it has something to do with the japanese belief that when a man gets aroused it changes his blood pressure to a level that can cause a nose bleed, and this part of town definitely provides plenty of opportunity for that. 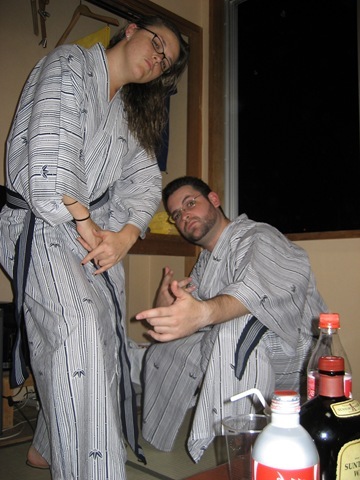 We are headed out to mount Fuji today so I’l be back with some stories and shots of that. I hope all my friends and family reading this are doing well, i love and miss you all. settled in, time for the real fun. I was a bit spent when we got back to the hostel yesterday so i really wasn’t up for some pleasant chit chat on here, but im well rested and showered now so heres the update. Yup, that’s mango… and look at the size of that toast! It was amazing. The poor waitress spilled a glass of water on my lap which was actually a great piece of fortune for us, she was so embarrassed she almost cried while she meeked out japanese apologies as quickly as she possibly could, all the while with me saying “daijobu, daijobu” to let her know i didn’t really mind. A big point of interest for me was finding a watch, since I had not brought mine and grown quite used to wearing one I needed a stand in (the tan line and constantly having to ask what time it was were also getting annoying), but anyone who knows me knows that it couldn’t be just any watch so we searched Akihabara high and low until i found the perfect watch and it will do just fine for this trip, here’s a shot of it. If anyone really cares to know how it works i’l explain when i get back. After that we went to Shibuya the worlds largest (by volume anyway) street crossing is. We participated in the crossing a few times as we made our way through this part of town. Its really a site to behold and if i could post the video of us actually going through the crossing i would but for now this picture will have to do: There is plenty to tell about this part of town but I can’t get to it all right now. After Shibuya we headed over to Shinjuku since everyone was kind enough to indulge me in a part of japan I personally wanted to see. The sound of pachinko could be heard from every single point in town. 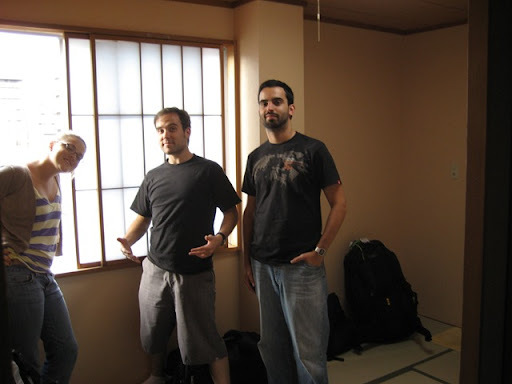 Some fumbling around with maps and a spot of fantastic luck landed us in a bar that we really shouldn’t have been allowed into, there were no “gaijin” to be seen and only businessmen were going in or out, shoes off and the whole 9. Not a single employee spoke a word of english as this is one place in town that foreigners never visit, thankfully they were still very kind and we both tried our darnedest to communicate. The end result was a modestly priced sake (apparently the better refined sake is served cold here) that was served to us in a way we had never seen even the members of the party who had already been to japan. They put the glass inside of a box then filled the glass to overflow and also fill the box, looked like this: Then we made our way to another hidden away place that was not used to foreigners, I guess they didn’t anticipate travelers to have good taste in food and drink but we were on the hunt for fine scotches and we found the place. A second story scotch bar called the Bar Hermit: Where I got to sample a rare treat and new favorite from the Islay region of Scotland: Laphroaig 30 years aged scotch, my comment at the time was “Its like drinking angels tears down an Oak luge!” needless to say it was delicious.